Music festivals, at their core, are about fun and music. But from the welcoming community to the mind-blowing art exhibits, they’re so much more than that. Festival-going has become a subculture all its own, where people gather to enjoy their favorite acts, make friends and take a break from the sometimes soul-sucking nature of everyday life. To get the most out of any festival, it helps if you know how to prepare for whatever the weekend tosses your way. Here are some rookie mistakes that are easily avoidable on your first festival foray. Not Staying Hydrated—Step one of a well-formulated music festival strategy: pack a water bottle. Most festivals allow you to bring in empty water bottles and fill them once you’re through security, so there’s no excuse not to stay effectively quenched. The risks of dehydration are heightened significantly when you’re moving around a lot in the hot sun (aka attending a music festival), so don’t skip your H2O breaks. Losing Your Stuff—It happens to the best of us, especially in the excitement of a big event, but it’s totally avoidable. You prevent losing personal items by keeping everything secured in a backpack or fanny pack or by wearing your sunglasses, vape or keys around your neck. Look for clever, hands-free ways to cart your stuff, like sporting a stylish vape that doubles as a necklace, and keep track of all of your belongings. Treating the Grounds Like a Trash Can—If you ever want to feel ashamed of humanity, take a few minutes to look at the mess left behind by festival attendees (brace yourself: it’s disturbing). Go into each and every show or event with the goal of leaving behind zero trace, as if you’re camping or hiking in a national park. At the same time, try to be conscious about not wasting too much and be sure to recycle, even if takes a little extra effort. 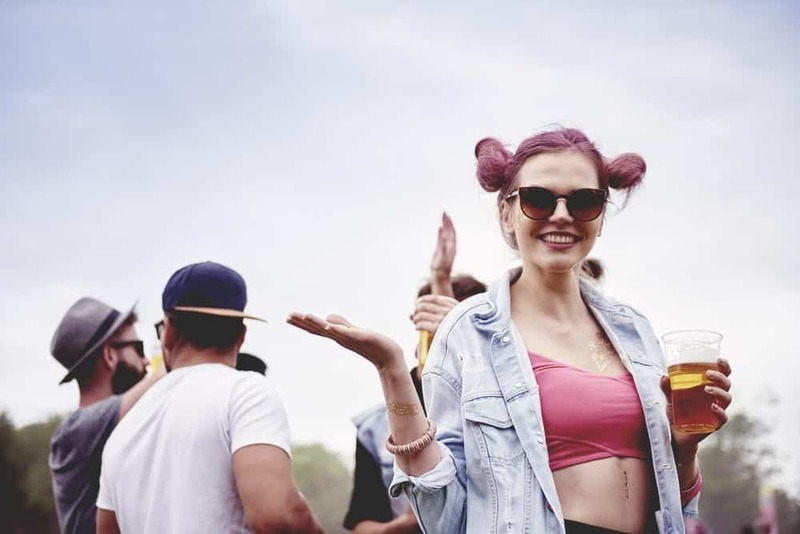 Getting Too Messed Up—You’ll be heading to the festival with a partner or a group of people who naturally feel responsible for one another. If you get too messed up to the point where others feel like they have to keep tabs on you, it puts a damper on their time, too. Plus, overdoing it on the drugs or drinking can put you in physical danger. For best results, pace yourself. Losing Your Friends—With all sorts of fun stuff going on in every corner of the venue, it’s hard not to get distracted by the music festival madness. Try your best to keep tabs on the group you came with. If you do intend to separate, make sure everyone’s okay with the plan and set a time and place to reunite. Don’t ever put anyone in the position of worrying about where you are. Keep your phone charged and on vibrate. Shoving Your Way Around—If you’re not cool with crowds, do not buy tickets to a music festival. Especially during the bigger main stage shows, you’ll see the cutthroat side of festival-goers emerge with a lot of pushing and shoving through the throngs to get to the front. Try your best to be polite, even when you’re packed in like sardines to see the big headliners, and don’t shove. Not Wearing Sunscreen—Too much sun exposure is never a good thing, especially when you’ve got two or three jam-packed days ahead. Make sure to diligently apply sunscreen every couple of hours and more if you sweat a lot. Even a little bit of sunburn can negatively affect your experience, so don’t be afraid to be that person who’s constantly shouting sunscreen reminders. Not Planning Who to See—This one’s a bit tricky. The goal is to create a plan so that you see all the acts you want to see (perhaps by making a list of top 10 or 20 shows) but not getting too attached to any strict plans. You want to get to a place during the festival where you’re not obsessively checking the time or worrying about FOMO. Consider your plans adaptable and don’t worry too much if you’re too tired to catch a certain headliner or if you’re captivated by something else and don’t want to leave. Heading to the Stage too Late—Someone on the lineup you really want to see? Make sure you’re at the stage early to get a good spot. While you don’t want to spend the entire day posted up at the main stage waiting for the final headliner, you also don’t want to be the person who’s disappointed by being way in the back (or shoving your way up front). Not Knowing Your Way Around—Make sure that you take a few minutes to study the venue map so you know roughly where everything is. Identify the various entry and exit points, the bathrooms and the first-aid tent so you’re prepared in the event of an emergency. At the end of the day, festivals are meant to be a fun and enjoyable outlet for music-lovers. As long as you’re being safe and sensible, you’ll be able to soak up every single second of this unique experience. Do whatever you can to put yourself in a place of positivity for the entire weekend and make your best effort to smile and have fun!